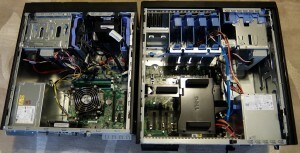 I have both servers running in my home lab right now, and thought a brief comparison of the 2 servers might be interesting to some folks who are shopping for their own home lab components. In terms of acquisition cost, the servers will be fairly comparable. At times, you can find great deals on either one. 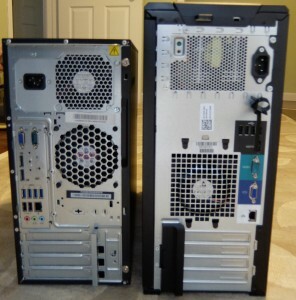 As you can see, the Dell Poweredge T110 II is physically larger than the IBM Thinkserver TS140. The Dell stands a few inches taller and is perhaps 1 inch deeper. I have them installed on a shelf in a standard 19″ rack. Both units fit comfortably into that 19″ wide space. Both units have 2 externally accessible 3.5″ drive bays and 2 USB ports in front, as you can see. 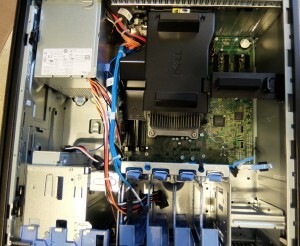 Turning around to the back of the servers, you can see that both have 4 externally accessible expansion slots. There are a couple ports available on the TS140 that are not present on the T110II: 2 display ports. There are also more USB ports on the rear of the TS140 than the T110II (4 vs 6 in total). Lets crack open these servers and have a look inside (below). As you can see, a few differences start to jump out at this point. The first thing you might notice is the drive configuration. As you can see, the T110II can fit more drives in it without resorting to docks or other shenanigans. The T110II can comfortably fit 4 3.5″ drives in addition to the externally accessible 5.25″ bays. By contrast, the TS140 has 2 carriers for internal 3.5″ drives, plus an externally accessible 3.5″ bay that you can also put a drive in. For drive expansion, the T110II wins hands down. Another interesting difference to note in this image is the cooling configuration. Notice how the T110II only has 1 fan outside of the power supply. The TS140 has 3 fans outside of the power supply. Here is a closer look at the TS140 internals (below). Hopefully in this image you can get a better view of the fan configuration, RAM configuration, and expansion options. And here is a better view of the inside of the T110II (below). In this image, look to the right hand side of the picture, about halfway down, on the motherboard. Those are internal USB ports. I really like internal USB ports as an option on my home lab systems because I use them to boot my hypervisor off of. This allows me to dedicate any internal drives to datastores without having any USB drives hanging off the exterior of the system. The T110II has this feature, while the TS140 does not. Noise: I’ve tested the sound levels coming from both of these systems during startup, idle, and heavy load. They are both comparable at idle levels. During periods of higher load, the T110II was slightly quieter. This is probably a result of the differences in cooling configuration. Heat: These servers have both been running for months, without any cooling, in a closet in my home. Neither server has had any issue with heat. Performance: I did not test performance because my systems are not identically configured from a component perspective. 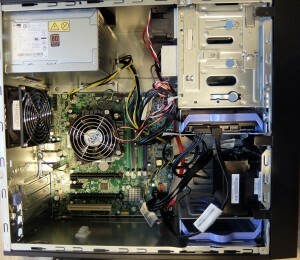 Overall: I definitely think the T110II gives you more server for your money. It has greater expansion options for a very small premium in added height. It gives you better acoustics and cooling configuration as a result of the fewer fans and airflow guide. It has the internal USB ports that I like to booth hypervisors from. 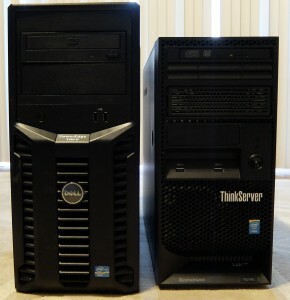 Given that you can get these servers comparably priced, depending on options and time of purchase (look for sales), I would go for the T110II every time. I wish I saw this before I bought a TS140 a few weeks ago. At least I got a good deal on it! iam looking for the dell mac t110 cpu casing if anyone has one please get in touch with me via email or my contact number +263772707802 ihave the motherboard but have no casing .